← #65 – A warm, sunny day on Cadair Idris – in February?! Long before I first visited The Peak District, I wondered why it was divided into ‘The White Peak’ and ‘The Dark Peak’ …. I think I get it now. The White Peak is named after the white limestone rock that dominates the landscape in that area, whereas the Dark Peak is named after the colour of the water you have just washed your socks in after walking there – the Dark Peak is the land of the peat bog! Regular readers will know that I’ve been on a bit of a mission of late. My knowledge of the Peak District and South Pennines has been on the scanty side until recently, and I’ve been filling in gaps – my heart is still in the mountains of Snowdonia, The Lake District and The Scottish Highlands, but the weather can’t decide if it’s going to be winter or spring, so I’ve been using some of the ‘off days’ to fill in some Pennine gaps. That Ewan MacColl bloke has a lot to answer for – his famous Manchester Rambler song starts out, “I’ve been over Snowdon, I’ve slept up on Crowdon, I’ve camped by the Wain Stones as well….” Well, I’ve been over Snowdon more than a few times, but it was only last year that I made my first visit to The Wain Stones (see post #19). 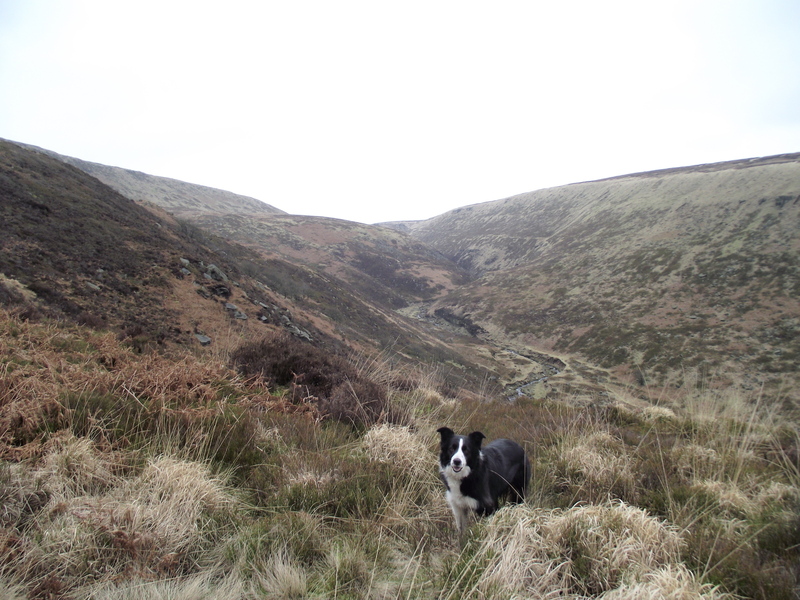 Crowden was still on the ‘To Do’ list, so I set off with Border Collie ‘Mist’ in what passes as typical Peak District weather. 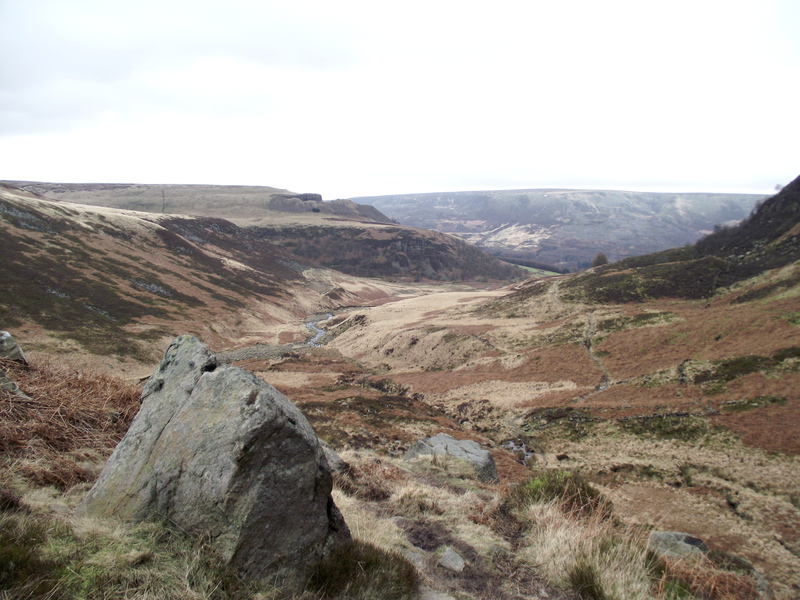 The aim was to follow the Crowden Horseshoe, setting off from Crowden, following the Pennine Way past the well known climbers’ crag of Laddow Rocks then heading for Black Hill. 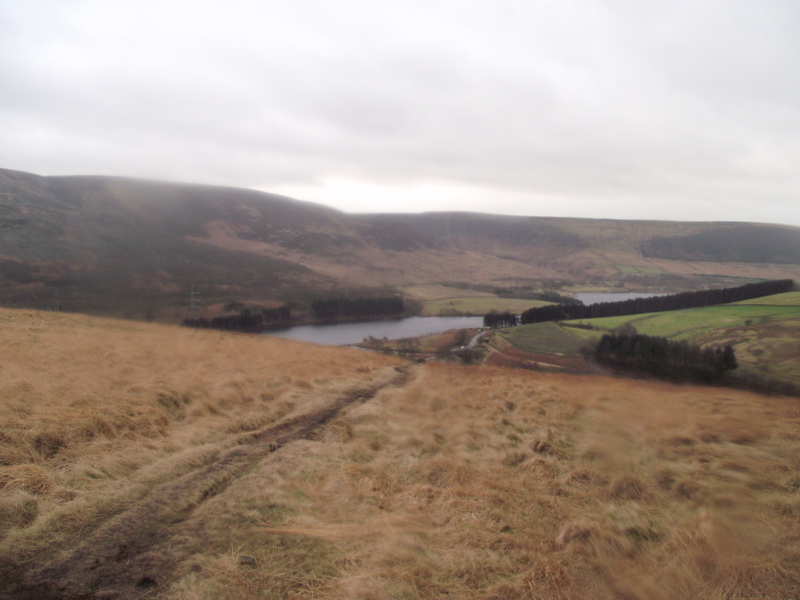 From there the return route was Tooleyshaw Moss and Westend Moss. 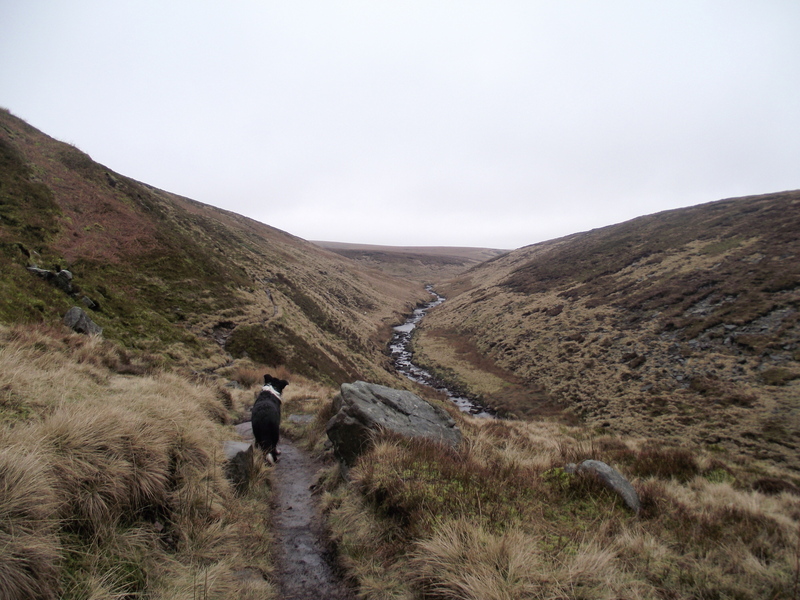 Anyone who walks in the Pennines will know that the word ‘Moss’ used as a physical feature is synonymous with ‘Mire’ – in other words, a bog will be involved somewhere along the way. 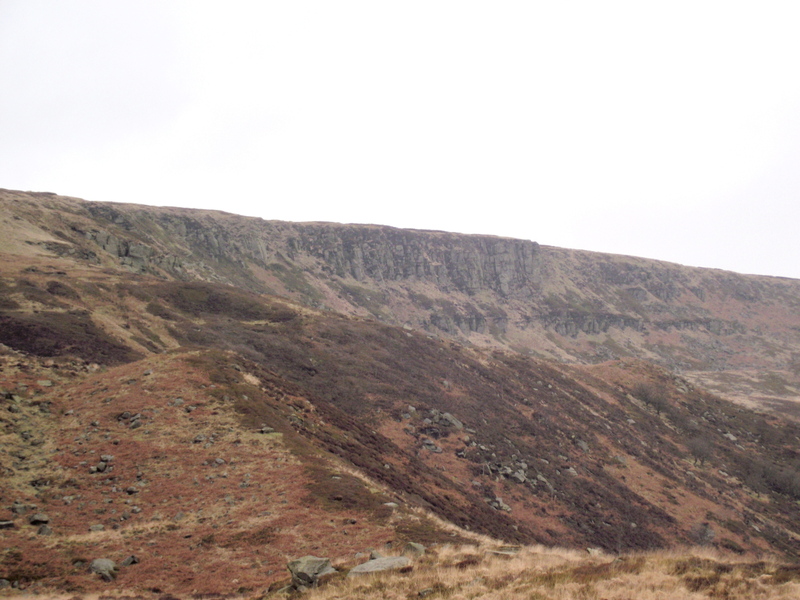 Looking back to a bleak looking Bleaklow …. 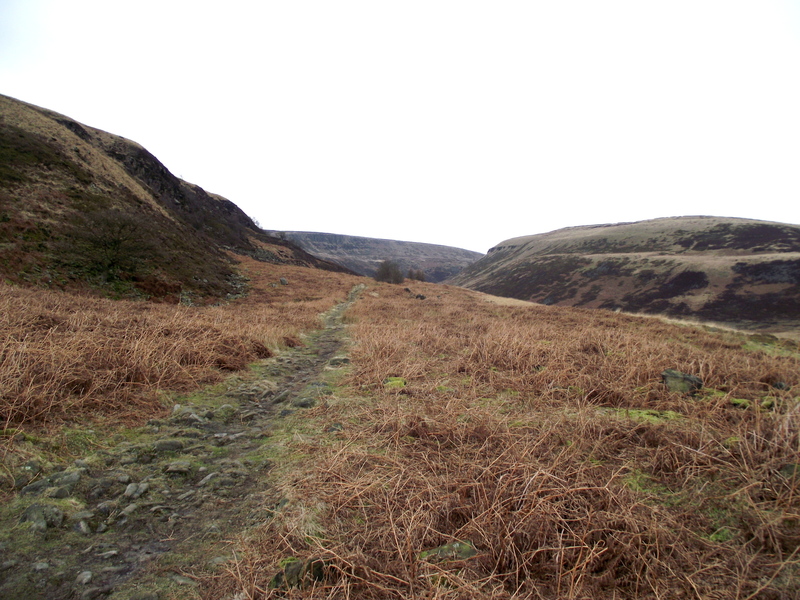 Black Hill used to be somewhat notorious regarding its status as a bog. Thirty years ago a visit to the trig point involved wading knee-deep in peat, but erosion has removed the greater part of this. 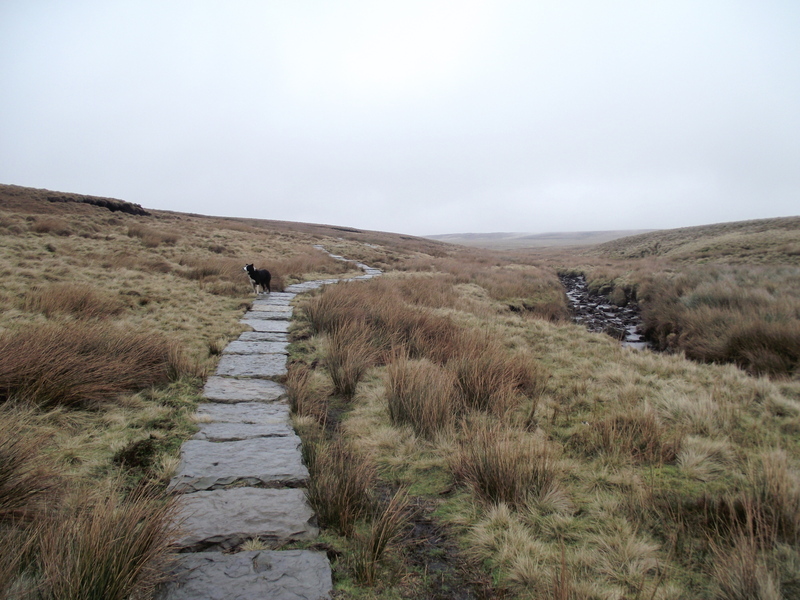 There are also long sections of stone causeway path over the worst of the bog, so I anticipated (correctly) that the first half of the walk was going to be reasonably dry. 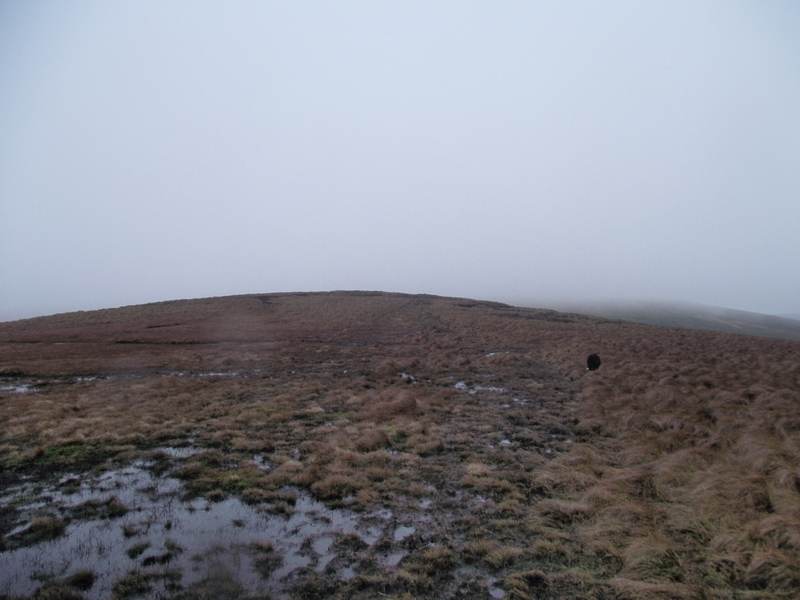 What I hadn’t anticipated was that the view on the tops was the inside of a cloud – the Met Office had promised ‘mainly sunny’ but the hills make their own weather. 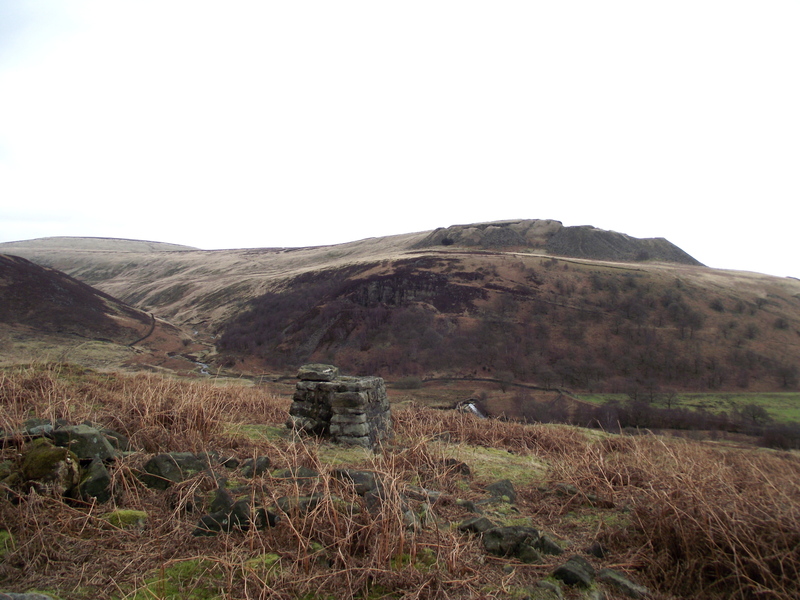 The Black Hill plateau is the smallest and lowest of the three gritstone and peat uplands of the Black Peak, the other two being Kinder and Bleaklow. 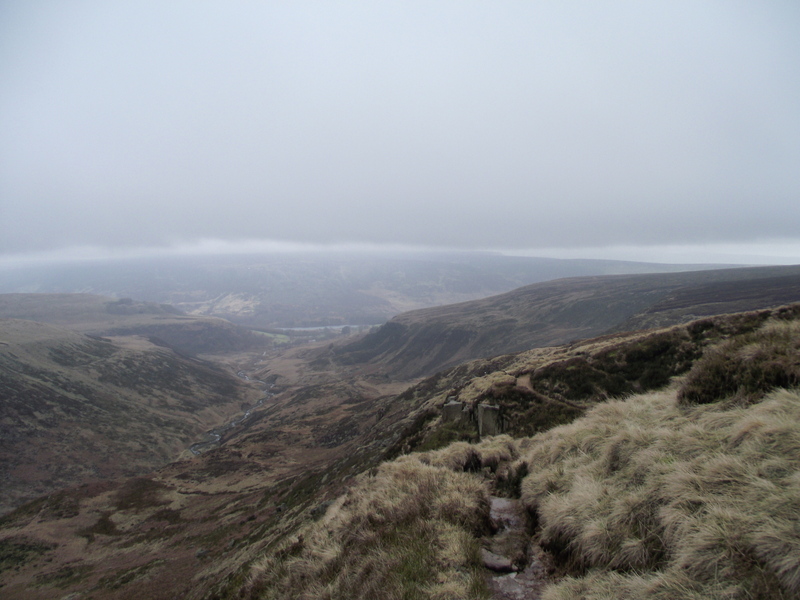 Despite not quite reaching 600 metres in altitude, it isn’t a soft option, and a navigational error here could mean an extended excursion through some of the worst peat bogs in the Pennines. 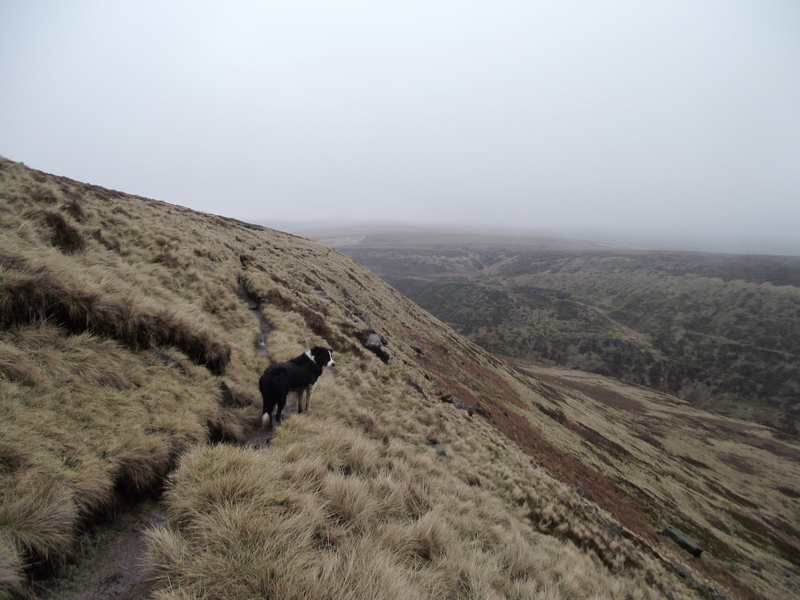 As I set off in the mist from Black Hill, I was probably paying more attention than usual on navigation. 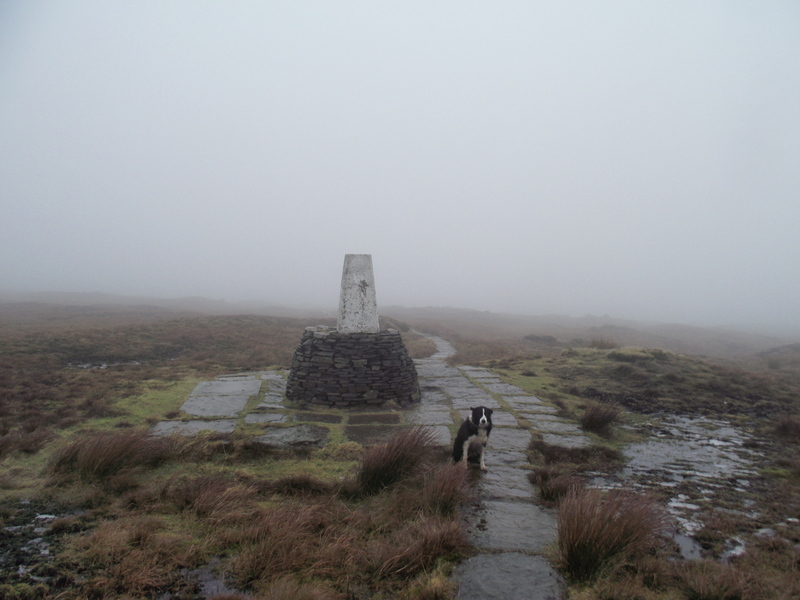 ‘Soldier’s Lump’ trig point on Black Hill- plus one bedraggled Border Collie! The first 100 metres of my return route over Tooleyshaw Moss and Westend Moss did not bode well! 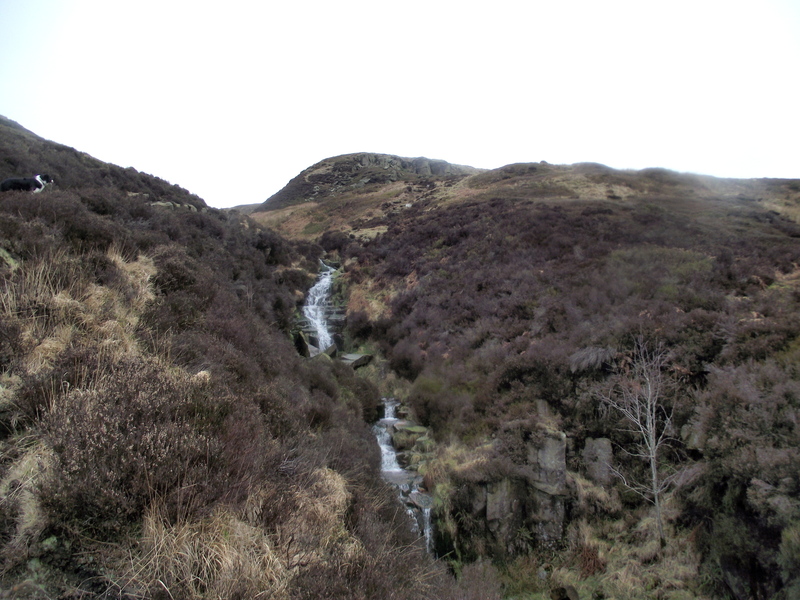 As I wandered back and forth, trying to find the least wet bit, I found myself seriously considering ‘bailing out’ and returning down the stone causeway path. Fortunately winter is still on the prowl, and I found that several sections were frozen enough to cross without getting wet – the secret was to keep moving before breaking through the frozen crust! Anyway, I completed the round without navigation error or a boot full of peat bog. The pics I brought back weren’t particularly interesting, as the inside of one cloud looks pretty much the same as the next cloud, and the light conditions were not of the best. Still, I got another bit of Peak District ticked off, and it was a better way to spend a day than sitting inside with a computer, writing a blog…! This entry was posted in 4. 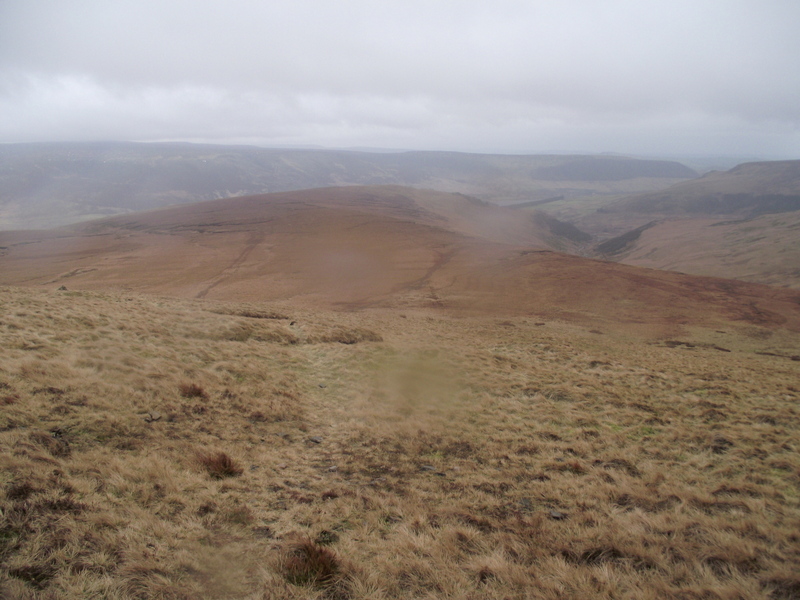 Northern England and tagged hillwalking, Peak District, Pennine Way. Bookmark the permalink. I only know bits of the Peak District, but it manages to feel remote even though you are never all that far from civilisation. 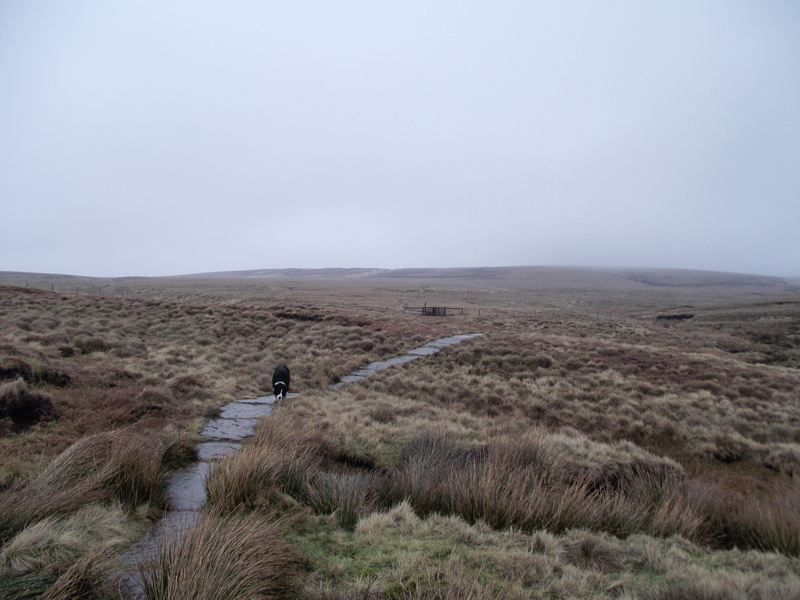 Tooleyshaw Moss sounds Irish… Love your explanation about the real meaning of the Dark Peak. Haven’t really started going to the Peak District yet and don’t really want to start as I have enough on with the areas I already visit and, unfortunately, work still takes up a lot of my time 😦 It’s alright for Richard whom I walk with who early-retired at 50!! 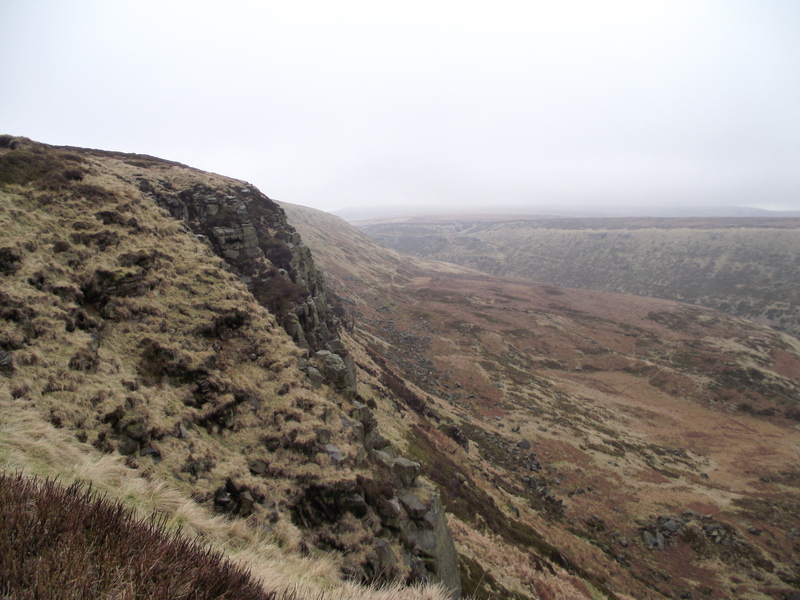 I’ve avoided the Peak District until recently, ‘cos I’ve lived nearer to “more interesting” hills. Having said that, there’s lots of interest to go at, but I know your Munro project is top of your current priotities.